Review by AllTheBestFights.com: 2016-11-05, Giovanni De Carolis vs Tyron Zeuge 2 gets three stars thanks to a good second part of the fight. Giovanni De Carolis entered this fight with a pro boxing record of 24-6-1 (12 knockouts) and he is ranked as the No.21 super middleweight in the world while his opponent, the undefeated Tyron Zeuge, has a record of 18-0-1 (10 knockouts) and he entered as the No.23 in the same weight class. De Carolis lost to Vincent Feigenbutz in 2015 (=Feigenbutz vs De Carolis) but he took revenge on him in 2016 winning the Wba super-Mw champion (=Feigenbutz vs De Carolis 2); after this fight he drew with Tyron Zeuge in their first bout (=Zeuge vs De Carolis I). Before this fight Zeuge had won over Ruben Eduardo Acosta. 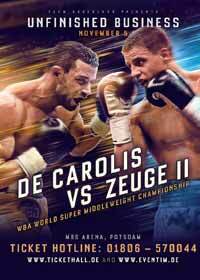 De Carolis vs Zeuge 2 is valid for the WBA World super middleweight title (De Carolis’ second defense). Watch the video and rate this fight!